If you would be interested in a copy of this, please email us at info@developingtechnologies.org with your details. 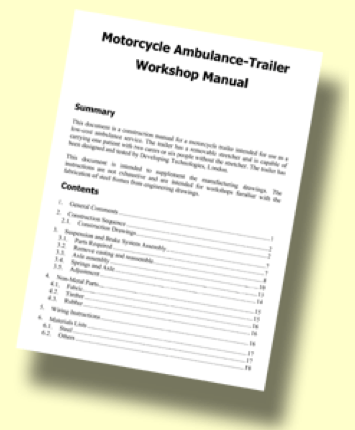 I would be very interested in a workshop manual with detailed instructions and drawings showing how to construct the motorcycle ambulance trailer, for possible use in South Sudan in a similar situation to Zambia and Malawi. Hi Steve, thanks for getting in touch – I will pass your message on to Ron, our Coordinator – who will contact you shortly.